Certain Thai curry pastes and soups that use star anise, and some blends of Thai ice tea use this as a flavorant. This is a classic Chinese spice that, in Thai dishes, is added primarily to soups. For the soup, add the whole seed pod instead of grinding it uup. The anise should not be eaten whole, but it looks pretty in the dish and imparts are wonderful aroma. 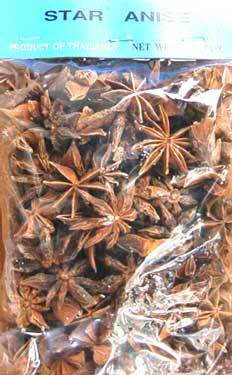 Star Anise is also used very effectively in making aromatic pot pourri, and many international dishes call for it. Product of China. ImportFood.com's star anise is recommended by Mark Bittman (New York Times). Anise is one of the key ingredients in Chinese 5 Spice. We also offer star anise powder.